Wärtsilä is strongly committed to research and development. The aim of its R&D activities is to continuously strengthen the company’s technology leadership position, and to further improve its competitive edge in the global marine and energy markets. This is achieved by developing products and services that are based on reliable, efficient, and cost-competitive technologies, and which address customer needs. The focus of Wärtsilä’s R&D activities is on digitalisation, smart technologies, new products, and solutions that are flexible, efficient, reliable, safe, cost-efficient to operate, and that have a minimal environmental footprint throughout their lifecycles. A substantial proportion of the company’s investments in product development is targeted at securing environmental compliancy, providing short- and long-term benefits for the company’s customers, and enabling sustainable societies. 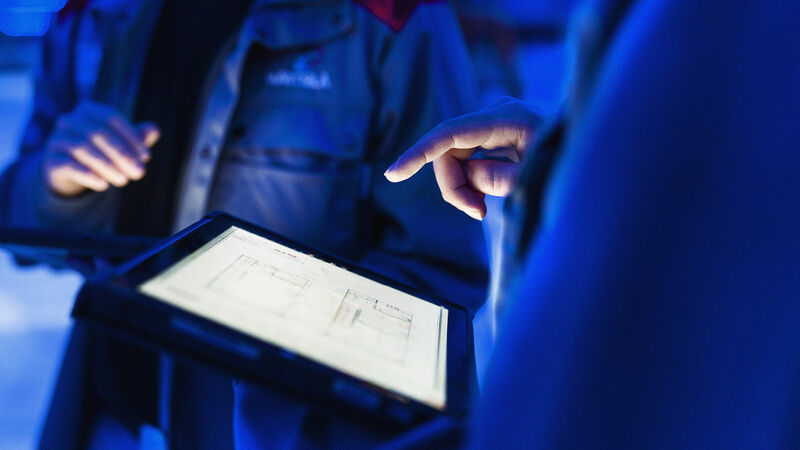 By focusing on the initial stages of the development process, and by utilising modularity, simulation, virtual testing, and validation, Wärtsilä is able to reduce the lead time for new solutions thereby securing reliability and safety aspects without compromising quality. Validation testing on site with existing installations, in co-operation with the customers, is an important element in furthering the improved performance of existing solutions. It also assists in finding new and better solutions while, at the same time, gaining long-term experience under real field conditions. A field installation also provides an opportunity to gain valuable learning and insight regarding new technologies and solutions. When the product has successfully passed all the validation process steps, both in the laboratory and in the field, and its performance meets Wärtsilä's high standards, it can be delivered to the market. Wärtsilä protects innovation and competitiveness through close attention to Intellectual Asset Management and the continuous development of internal key competences. Networks and clusters are formed to further extend the company’s know-how, skills, and capabilities by committing to long-term relationships with suppliers, engineering companies, university partners, and with licensees and other Original Equipment Manufacturers. The long-term HERCULES R&D programme was conceived in 2002, and has been set up within the context of the EU's sixth and seventh Framework programmes. Sharing a joint vision, the major low- and medium-speed engine manufacturers, Wärtsilä, Winterthur Gas & Diesel, and MAN Diesel & Turbo, are collaborating with universities, research institutions, and other industrial partners to develop new technologies for marine engines and related systems. The fourth phase kicked off in 2015 in the form of the HERCULES-2 project that aims at creating fuel flexible large marine engines that are optimally adaptive to their operating environment. The HERCULES-2 consortium comprises 32 partners of which 30% are Industrial and 70% are Universities or Research Institutes. HERCULES-2 is planned to run for three years, from 2015 to 2018, with a total budget of EUR 25 million. The project was made possible by a EUR 20 million funding through the European Commission Horizon 2020 Innovation Programme and a contribution from the Swiss government. In November 2017, Wärtsilä entered into a unique co-operation program with four leading Finnish universities on developing world-class research into sustainable future applications for internal combustion engines. The academic institutions participating in this Engine Research Initiative (ERI) programme are Aalto University, Tampere University of Technology, Åbo Akademi University, and the University of Vaasa. The ERI aims at creating an open research ecosystem wherein cutting-edge technologies involving internal combustion engines can be developed together with other partners, and matured to meet the evolving future needs of the shipping and power production sectors.